Spray Bottle #1: Gather up all those business cards you have in piles, drawers, etc. and scan them into your data base. There are a lot of great and inexpensive programs out there to make this easier. Spray Bottle #2: Now take all those names you have and create an E newsletter letting people know what is coming at your business for the Spring and Summer. Add a few tips to help them out or offer a special just for them and they will remember you! Spray Bottle #3: Wash the windows! No, I mean really wash the windows! Just looked out ours the other day and it was pretty ugly. Spring is a time to see and enjoy the green! Spray Bottle #4: If you do Social Media for your business – refresh your cover photo, add some more photos and plan some new contests or campaigns? If you work with an outside firm, sit down and do some brainstorming to create some buzz. Your participation & input is key to the success or failure of your social media. Spray Bottle #5: Rearrange the furniture – paint a wall – put up new pictures – get some flowers – anything that creates a feeling of growth and renewal. Spray Bottle #6: Focus on making your business leaner and more efficient for the season. Have a project you just can’t get too – hire a consultant to do that one time project and get it out of the way. Maybe you need a summer intern to help lighten the load. Maybe you need to do some cross-training. 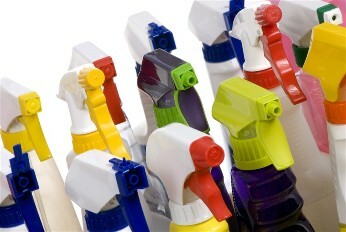 Spray Bottle #7: Get your To-do list in order and make it manageable! For every item on there: Assign a C, D or G Complete it, Delegate it or Get rid of it. Spray Bottle #8: Practice the art of really listening to your customer. Forget the surveys for a while. Just have a conversation and really listen. Tell them you have an idea or a dilemna and ask them for input. You will be surprised what they reveal. Spray Bottle #9: Clean up your technology. Add or update software, assess your needs for computers, printers, registers, etc. and either repair, replace or just give them a good cleaning by a reputable firm. Spray Bottle #10: Make sure you take some time for yourself to re-energize after a long winter. You can’t do the business justice if you don’t do some spring cleaning on yourself! Plan a healthier menu or take dance lessons, anything that stokes your body and mind.